Three women have presented themselves to police in Londonderry claiming to having broken Northern Ireland's abortion laws. 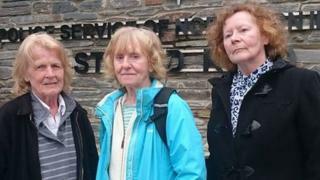 Diana King, 71, Colette Devlin, 68 and Kitty O'Kane, 69, reported to Strand Road police station on Monday evening. They gave police a prepared statement saying they had taken delivery of abortion pills for women too afraid to have them delivered to their homes. They were questioned before being released pending a report to the PPS. A Facebook post, uploaded while the women were being questioned, said they admitted "either providing the abortion pill or taking it themselves". It continued: "People handing themselves in highlights the unworkability of the law. "It lays bare the hypocrisy of the government and pressures the state to scrap it. "If the police wish to criminalise one woman for a crime that so many of us have committed, then there can be no exception to the law, we must be arrested as well. "Prisons would be filled to the brim if the law was actually enforced." A solicitor for the women has told the BBC they were questioned by police officers for about three hours before being released pending a report to the Public Prosecution Service. Last month, a 21-year-old woman, who bought drugs on the internet to induce a miscarriage, was given a suspended prison sentence. She bought two types of drugs online, took them and then miscarried on 12 July 2014. However, taking drugs to bring on a miscarriage without doctors' consent is still technically an offence anywhere in the UK under the 1861 Offences Against the Person Act.